Is an S Corp better than an LLC? Is an LLC better than an S Corp? is an LLC better than a sole proprietorship? is a sole proprietor better than an LLC? is a sole proprietor better than an s corp? S corp, S corp, Subchapter S, Subchapter S corporation are all the same thing by the way. Yes, an S Corp is better than an LLC when your tax savings outweigh the costs of complying with the required formalities. You’ll need payroll, bookkeeping, to file a corporate 1120s, and establish some legal documentation and procedures. We specialize in taking care of payroll, tax planning, tax returns, bookkeeping, and every other accounting formality for S Corps. Email Rsatrom@nuancefinancial.com for a consultation today! If you’re an entrepreneur and small business owner, I’m sure that this question is either one that you’ve answered in the past, or one you’d like answers on. Not only is it helpful to determine whether an S Corp is a good fit for you and your business, but its’ critically important to understand the ramifications of converting to an S corp, filing an S election, and keeping up your S Corporation. For business owners who have created, what I like to call “wealth conundrums” because they’ve begun to earn enough money that they are faced with a treacherous marginal tax code, an S corp answers the greatest question small business owners ask: how to reduce my business taxes? If you make net profits that are higher than about $40,000, we highly recommend that you have us show you exactly how much Social Security tax and medicare tax you might be able to mitigate through an S-corp. We’d also recommend that you hire Nuance Financial Tax & Accounting to manage all the “reasonable salary” and payroll tensions within your S corp.
For entrepreneurs earning 1099 income or income which would be subject to self employment taxes, an S corp is better than an LLC. The key is that you should only become an S corp or file an S-election once the self-employment tax savings you’d experience outweighs the costs of having a payroll system, great bookkeeping and filing an 1120s tax return. Why is an S corp better than an LLC? Because you can Reduce your social security taxes with an S corp.
Self employment taxes are the combination of your social security taxes and medicare taxes. Right now, the social security tax rate is 12.4% on your earnings up to $127,200 in 2017. This is a $10,000 social security limit increase in 2017 from 2016. If you did earn that if you did earn that additional $10,000 in wages, you had the pleasure of paying in an additional $1,240 a year in social security taxes in 2017 or another $100 a month. That additional $100 a month is critically important, since the future value of a monthly $100 investment into a mutual fund that returns 8%, would be $95,103 after 25 years. Self employment medicare tax is a little bit different, you will owe 2.9% on the first $200,000 of self employment income and then you’ll add another .9% if on all earnings above $200,000. This means that you’d owe a 3.8% medicare tax on all your wages above $200,000. $50,000 of business income, you’d owe 15.3% in self employment taxes which is $7,650, or $637 a month. $120,000 of business income, you’d owe $18,360 in self employment, leading to $1,530 a month. You can see the impact of your self employment taxes are deeply discouraging when you’ve been accustom to having the gross revenues pour into your bank account. Not only will you owe these self-employment taxes, but now you’ll have to pay state and federal income tax on all of your earnings as well. This means you’ll end up taking about 30-55% of your income and sending in to the IRS, social security administration, and the ever-so-thrifty medicare program. Luckily, the government has had times when Dr. Jekyll subsides, and the good Mr Hyde helps out the job creators of this nation. The government, when it’s not trying to increase egg production by strangling the chicken, wants to stimulate jobs & housing. Because the government wants to stimulate jobs, it provides some opportunity for business owners to experience some tax savings inside of an S corp. The provide the s corp opportunity because you’ll be more likely to grow your business and hire other workers if you go through the work to abide by the formalities required for an S corp. The S corp is a small business owners savior! It’s important to add here that technically both and S corp and an LLC are the same legal structure. They are both LLC’s, one is an LLC taxed as a sole proprietor, and the other is an LLC taxed as an S corp. There are legal, and tax requirements and benefits to consider when deciding whether an LLC or and S corp is better for your organization. The salary that you pay yourself will be subject to the social security and medicare tax “self employment tax” of 15.3%, but the owners distribution or dividend portion is NOT subject to self employment taxes of 15.3%. How low can my s corp salary be? This is great question, and for business owners – it is like the greatest question of all time (as it pertains to small business taxes) The bottom line is that the IRS says you need to take a “reasonable salary”. What is a reasonable salary for your s corp? What factors determine a reasonable salary for an s corp? The bottom line about “what is a reasonable salary for an S Corp? The IRS language is somewhat vague and subjective, but the idea is to be trustworthy, honest, and appropriately aggressive. We encourage people to be thinking in terms of never taking a salary lower than a third of your profits, and to consider all of the factors involved to determine a reasonable salary for an s corp. 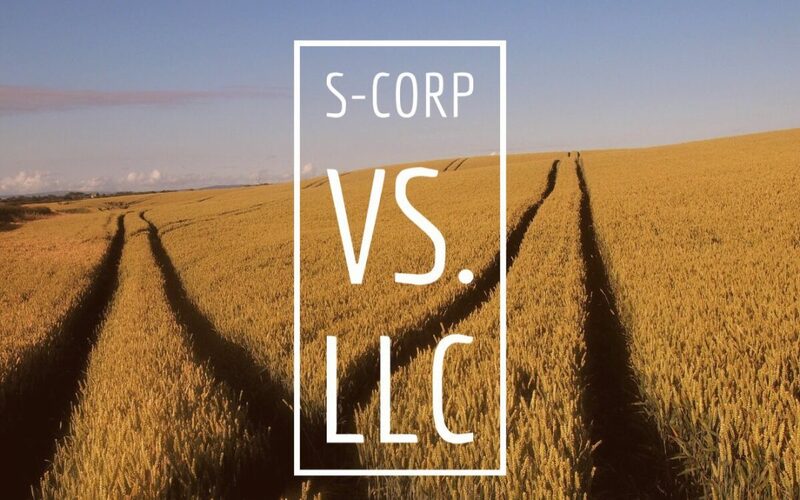 Both an LLC and an S Corp are “Limited Liability Corporations” when it comes to the legal side. The premise is that you use this legal entity to create separation between you’re personal assets and the business. If you’re wondering “how do I create a corporate vale with an LLC?” I’d encourage you to know that very seldom does a single owner LLC enjoy a true corporate vale. If there is a legal recourse to take, it’s pretty difficult to have your LLC mitigate the damage. The biggest reason that Sub Chapter S vs. LLC is such an important thing to be examining, is because it can provide you with tremendous self-employment tax savings. You’ll want to work with a professional to manage the tensions within this Subchapter S.
We see that business owners are often able to reduce their social security and medicare taxes by 20%, 30%, or even 70% depending on how arcane your accountant has been. The bottom line is that when you file a subchapter s election or “s-election” with the IRS and secretary of state office, you’ll now have some legal bureaucracy and tax decisions to make. In order to take advantage of the tax mitigation opportunities in an S Corp., the government requires a number of formalities. There are some tools available to handle the corporate documents and procedures. We specialize in handling all of the payroll, bookkeeping, tax filing, tax prep, And other bureaucracy needed to handle the S Corp.
You will want to make sure that you do the S Corp properly, choose a reasonable salary, and operate like a true corporation because there is a risk that your dividends could be reclassified as income if done improperly. This would lead to audit headaches, back taxes, penalties and interest payments. It’s best to allow a professional to keep things compliant and guide your decision making. When we are handling everything for a client and guiding their decisions, it makes it very easy to boldly engage with an auditor because you’ve been making the necessary accommodations to abide by the required formalities. It’s because of these S Corp formalities that we recommend waiting to become an S Corp. until your net profit kids somewhere in The realm of greater than $40,000. When your business has a net profit of greater than $40,000, the cost associated with all the bookkeeping and nonsense Will be offset by the savings you’ll receive in self-employment tax mitigation.